ORDER OF SERVANTS OF MARY O.S.M. During the interdict of Pope Martin IV against Forli, Philip Benizi, then prior General of the Servite Order, visited Forli and exhorted its citizens to peace and submission to the Pope. Philip was driven out of the city with insults and violence by a gang of young men, among whom was an eighteen year old by the name of Peregrine. Peregrine was well past middle age when he developed cancer; it showed itself as an ulcerative condition to his leg which refused to heal. The only hope of saving his life would be to amputate his leg. The night before the scheduled operation, Peregrine prayed with fervent faith before the image of the crucified Christ and was miraculously healed. He lived to the age of eighty and was canonized by Pope Benedict Iliii in 1726. Claims of healings came to be associated with Peregrine. Around the world, many cancer sufferers and their families speak of how St. Peregrine had helped them to find comfort and acceptance in the face of all the difficulties that serious disease brings. St. Peregrine is now recognized as the Patron Saint of those who suffer from cancer and other diseases. 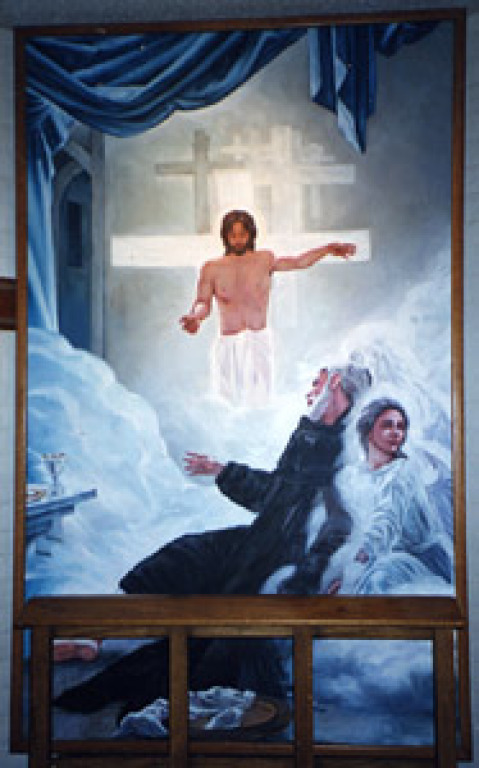 SEE THIS PAINTING IN OUR FAITH FORMATION CHAPEL.